No bake Chocolate Coconut Truffles made from scratch. Line a large baking tray with baking or parchment paper. In a large mixing bowl, add coconut, sugar, condensed milk and vanilla and mix well. 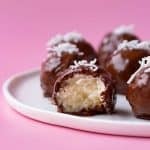 Scoop heaped teaspoons of the coconut mixture and roll into balls using your hands and place onto your prepared tray – its ok if they’re a bit sticky. If the mixture is too wet to roll, add a tablespoon or two more coconut. Once you have rolled all your coconut into balls, place into the fridge for at least 1 hour. Add chocolate to a heatproof bowl and heat in the microwave until melted and smooth. Dip the truffles, one at a time, into the melted chocolate, and use a fork to gently lift the truffles out and place on prepare tray. Sprinkle a little extra coconut on top of each truffle. Place truffles back in the fridge to set for at least 30 minutes. If you want to make these gluten free, make sure you use gluten free chocolate.